The latest software release from global Business Intelligence (BI) and analytics software vendor Yellowfin, Yellowfin 7.2, has been praised in an independent report compiled by industry analyst firm, Blue Hill Research. 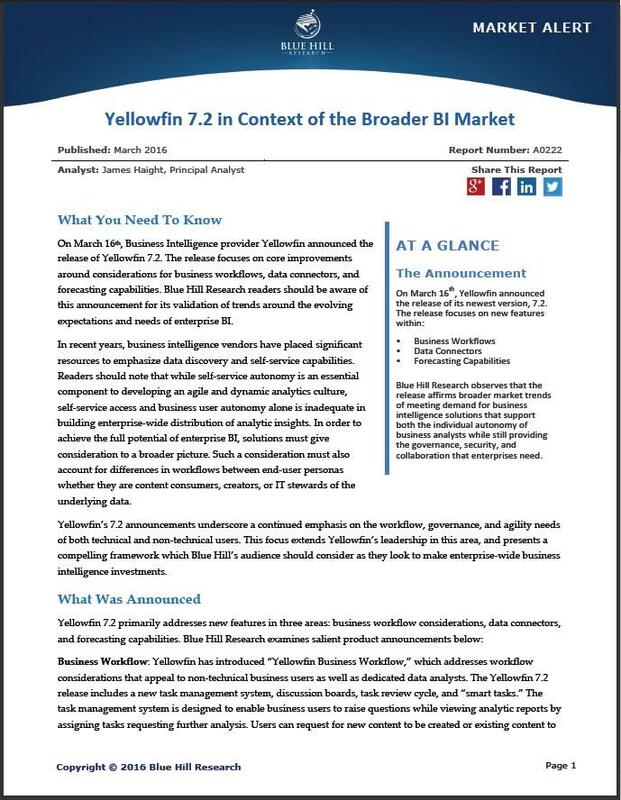 Authored by Blue Hill Research Principal Analyst, James Haight, the Market Alert – titled Yellowfin 7.2 in Context of the Broader BI Market – assesses Yellowfin 7.2 in the context of the “evolving expectations and needs of enterprise BI”. 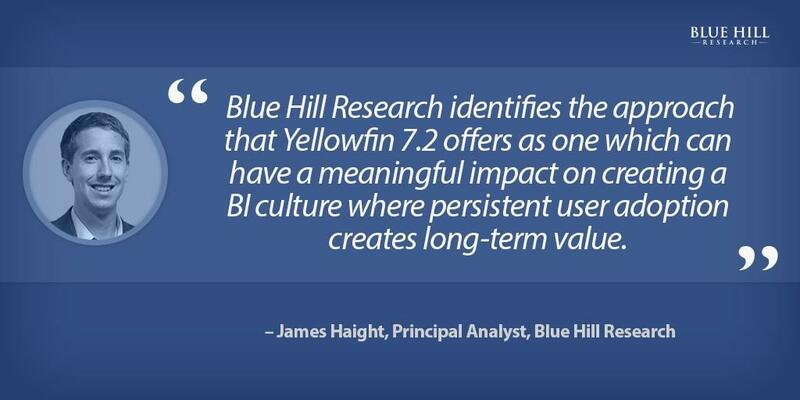 Blue Hill Research highlighted Yellowfin’s Business Analytics Workflow, stating that enabling different types of BI users to effectively collaborate was critical for facilitating enterprise wide BI deployments. Yellowfin Co-Founder and CEO, Glen Rabie, said that Blue Hill Research’s independent evaluation of Yellowfin 7.2 provided strong validation for Yellowfin’s product direction. Haight’s recommendations in the Blue Hill Research report echoed Rabie’s comments. Blue Hill Research is a research and advisory firm focusing on the enterprise technology marketplace. Based on this focus, Blue Hill educates three key stakeholders: Enterprise Executives making technology investment decisions, Technology Vendors making product and strategy decisions, and Independent Investors taking equity positions in technology markets. Blue Hill Research is a subsidiary of New Technologies and Associates.